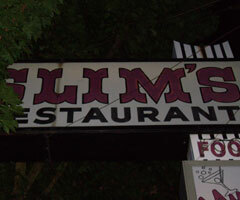 Our first gig at Slim's....and we had the evening all to ourselves. Each set had its own unique feel. Set 1 featured mostly up-tempo vocal tunes, while Set 2 was all instrumental and more on the spacey side. It featured particularly strong renditions of Syrian Rue and Immaculate Reverberations, as well as a rare version of Starfield. James also debuted a cool new loop after Road Hog. Due to pre-show technical difficulties we had to bypass recording this performance.